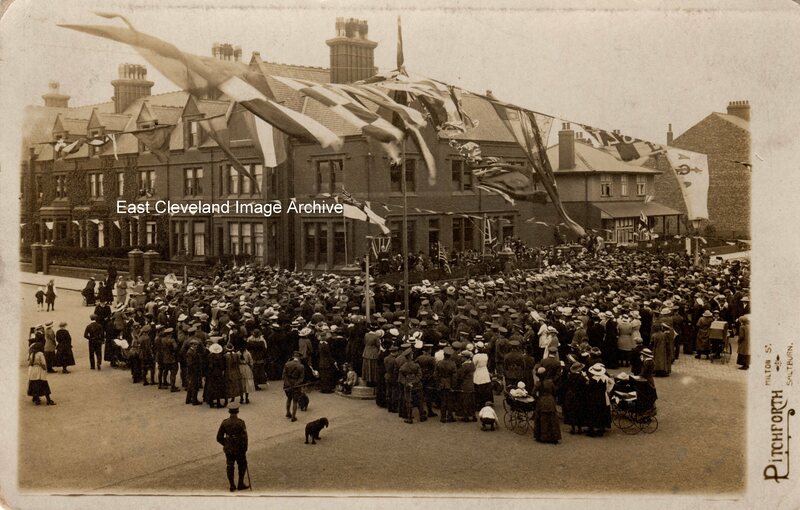 This postcard image of ‘Chocolini’s’ corner in modern-day Saltburn is believed to show the Peace Celebrations at the end of the First World War; based upon the variety of flags, Boy Scouts being present and numbers of uniformed persons present.Researches have indicated that the Vicar of Emmanuel Church, Saltburn from 1913 till 1925 was Arch Deacon T. E. Lindsay; from photographic evidence now available to the Archive he would appear to bear a very strong resemblance to the Vicar conducting the proceedings on the corner of Windsor Road and Albion Terrace. Further information having come to the Archive indicates the electrification of the street lights (an incomplete light features in the foreground of the image) was completed by 1919, the Archive now has a postcard dating from September 1920 showing this street light completed. But the Archive would welcome comments, supporting evidence or further information. Image and information courtesy of Geoff Kitching, additional information courtesy of Emmanuel Church Centenary Magazine 1967.